Researchers face significant challenges when trying to understand, reproduce or reuse research in which software played an integral part. One of these challenges is to simply understand what software was used. Here are our top ten tips for describing software in research papers. Describe any software that played a critical part in, or contributed something unique to, your research. Do this in enough detail for a peer to be able to understand what you did, repeat and validate what you did, and reuse your research. The are many options for describing the software you have used: footnotes, acknowledgements, methods sections, and appendices. Be aware that a licence may place you under an obligation to attribute the use of software in your publication. Cite papers that describe software as a complement to, not a replacement for, citing the software itself. In the first draft of a paper, always put software citations in references or bibliographies. Be prepared to debate with reviewers why you have cited the software: you want to acknowledge the contribution of the software's authors and the value of software as a legitimate research output. Inform reviewers if you are legally obliged to cite the software because of a clause in the software's licence. If a reviewer disagrees with a formal software citation, you can still make a general reference to the software in the paper. Recommended citations may not have enough information to accurately describe the software that was used - you may need to add more detail yourself. If the software has a DOI (digital object identifier) use it to cite the software. If the software has its own website, use the website's URL for the citation. 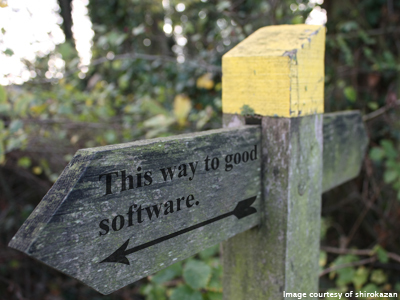 We're currently working on a green paper (How to cite and describe software) that describes the challenges researchers face when writing about software in research, and our motivations for writing this top tips post. Let us know what you think by email or by commenting below.